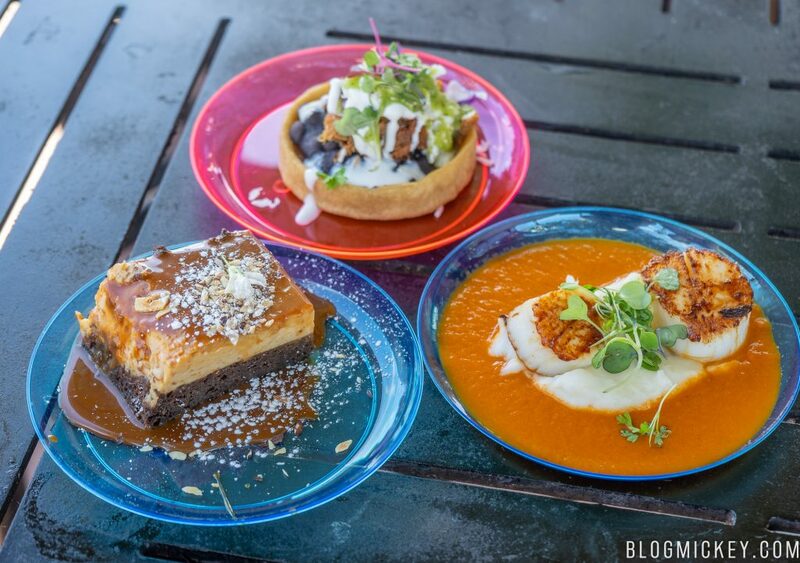 Welcome to a review of El Artista Hambriento Food Studio at the 2019 Epcot International Festival of the Arts. El Artista Hambriento debuted in 2017 and is described by Disney as Classic Mexican dishes designed to satisfy artists of any age. 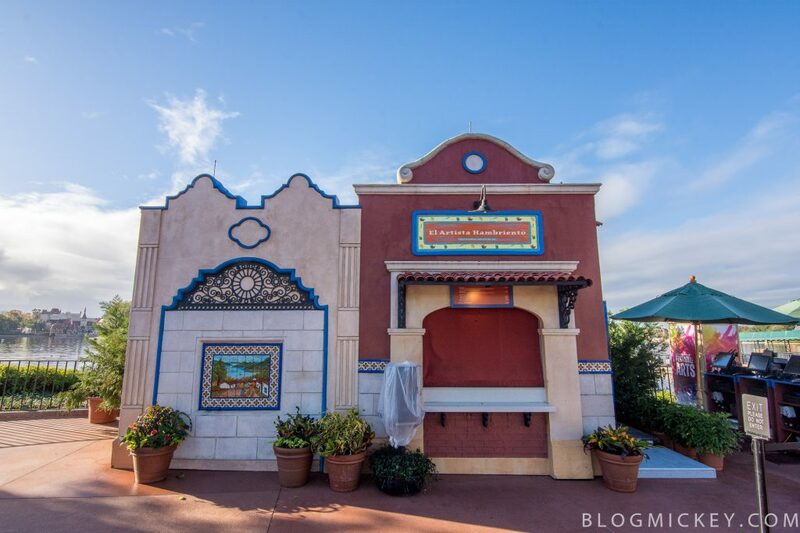 El Artista Hambriento Food Studio is located in Showcase Plaza, near the Mexico pavilion. This review will cover the items available for purchase during the 2019 Epcot International Festival of the Arts which runs daily from January 18, 2019 to February 25, 2019. 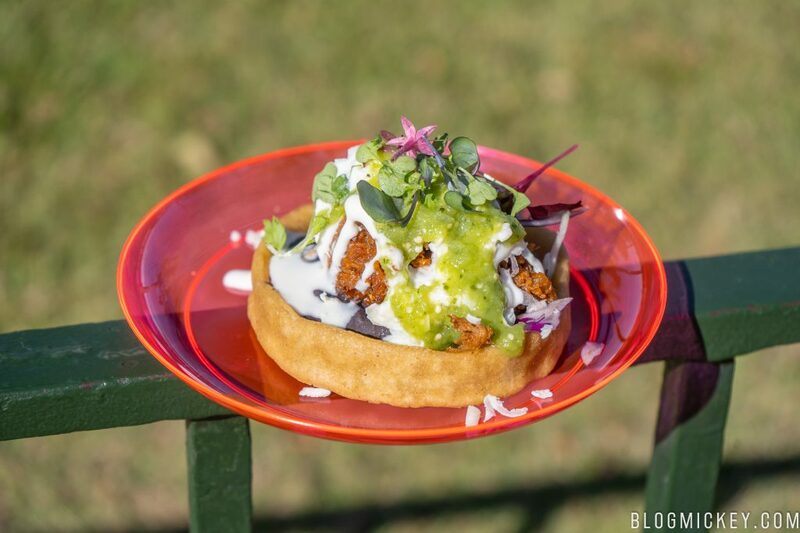 Sopes de Chilorio contains slow-braised pork marinated in ancho chili paste served on fried corn dough with black beans, queso oaxaca, crema mexicana, and salsa verde. We start with a return to a corn tortilla-based dish. If you like the authentic corn tortilla taste that has been found at the Mexico booth in years past, you will be happy to know that you get even more here. The various elements worked well, but we found the slow-braised pork to be a bit dry (and the dish, overall), despite plenty of “wet” ingredients. The pork is flavorful and there are some bites that work really well, but between a dry corn dough base and dry pork, this dish falls into the pass category for us. 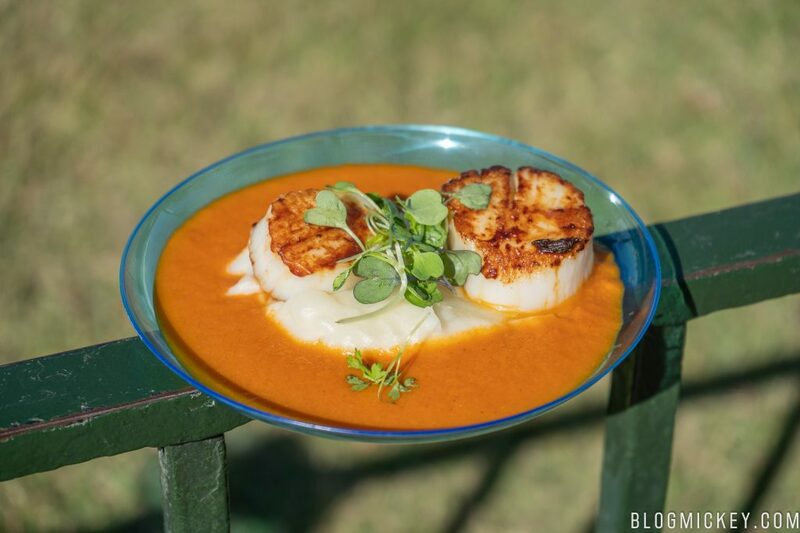 With this dish, you’ll find two seared scallops with ginger-habanero sauce atop yucca puree. Switching gears from meats and refried beans, we find scallops on our plate. I don’t recall getting scallops from a Mexico booth before, but just like almost all scallop dishes at Epcot festivals, you’ll find a well executed offering here. The scallops are soft and cooked to a slight char. They surrender easily to a plastic fork and soak up the yucca puree well. A bit of an oddity with this dish was the ginger-habanero sauce atop the yucca puree. It hit the palate like a spicy tomato soup more than anything else. It wasn’t terrible, but it was a bit unexpected and cheapened the taste a bit. 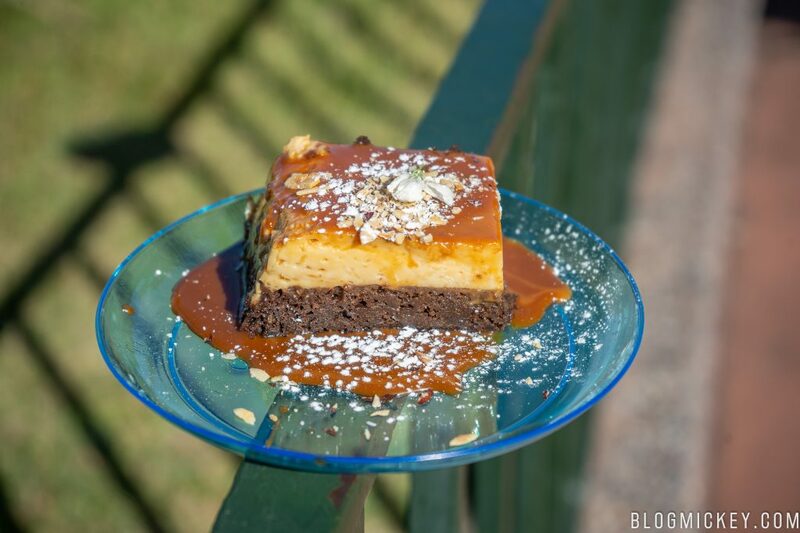 The Chocoflan is a creamy mexican custard and chocolate sponge cake topped with cajeta and hazelnuts. We really, really liked the Chocoflan. We’ve seen flan in festivals past and while they are usually decently prepared, they never stood out to us. This year is different. The flan is set atop a moist chocolate sponge cake and everything here works amazingly well. If you’re a fan of flan like we are, adding the chocolate sponge cake base adds a wonderful texture and chocolate flavor to the dish. We can definitely recommend this dish. Overall, El Artista Hambriento Food Studio was better for us than other Mexico booths in years past. We’ve always found the food to be a bit bland in years past, but things have improved. Ultimately, we will only really return for the Chocoflan, but it’s a decent lineup. El Artista Hambriento falls somewhere in the middle of the pack for Food Studios at the 2019 Epcot International Festival of the Arts.